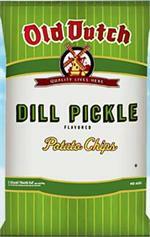 Old Dutch Dill Pickle Potato Chips have the salty taste that packs a rich dill punch every time. They're crispy, satisfying, and simply delicious. Ingredients: Potatoes, Sunflower and/or Canola Oil, Corn Maltodextrin, Dextrose, Salt, Sodium Diacetate, Citric Acid, Herb and Spice, Onion Powder, Modified Cornstarch, Garlic Powder, High Oleic Sunflower Oil, Natural Flavor, Vinegar Solids and less than 2% each Silicon Dioxide and Calcium Silicate (as anti-caking agents). have tried different brands of dill pickle, but growing up in North Dakota, Old Dutch brand is the best, I have tried 3 other brands of dill pickle non compare. The best dill pickle potato chips ever! A friend of mine who's a flight attendant that used to live in Minnesota, brought a bag of these chips back to Hawaii after a visit back home. I was hooked ever since! No other pickle potato chips compare. I'm so glad that I'm able to order them from Bob's, It's the price for living in Hawaii, but they're worth it! I grew up in WI. Dill pickle are my favorite, no other brand of dill pickle even compares. Loved the chz popcorn growing up as a kid. My wife is gluten intolerant, so glad to see Old Dutch go the extra mile to make these gluten free. I will be a regular customer from here on. I grew up in ND and these have been my favorite chips all my life! Then I moved to ID and haven't been able to find them (except that one time I went to Canada). Thank you for shipping to those of us that have moved out of the upper midwest! No other dill pickle chip remotely compares to Old Dutch brand!